Finn Johannsen is a man whose life is filled with music – a DJ since the mid-80's, he has built up an impressive record collection and a vast knowledge of everything music. Not just house or techno, but MUSIC, something that gives him a rare quality as a DJ: the ability to make any type of track work in a Dj set. He is also a writer for a range of publications and websites such as de:bug, Groove and Resident Advisor, and make sure to check out his website http://finn-johannsen.de/ for great articles, interviews, mixes and info about where you can catch him DJing. Some of you may also have run into him at Hardwax, where he pushes vinyl to Berliners and techno tourists who have made their pilgrimage to this holy church of techno. 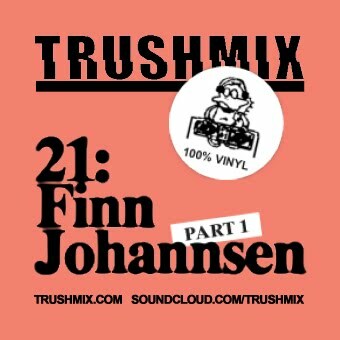 Trying to descibe Finn Johannsen's Trushmix with words would almost be an insult – this is one of those instances where you just have to hear it to believe it. What we can tell you though, is that the mix is based on a foundation of reggae, and that it clocks in at just over FOUR HOURS – and that's just the first part! Part two will be posted soon – until then, have a crack at Trushmix 21: Finn Johannsen. DIG IN AND FREAK OUT!